In June 2009, National Lumber announced the addition of Pro Insulators to the National Lumber Family of Companies. National Lumber strives to provide our customers with all the materials and services needed for new construction and renovations, while also staying current with building trends and environmentally conscientious methods. Reducing heating and cooling costs is always a welcome benefit, and Pro Insulators have the expertise to work on new and retrofit projects. We ensure you will have the security of knowing only an experienced team will work on your project. Plus, customers have the additional benefit of having this work invoiced on their National Lumber credit account, and National Lumber's warranty on the products and installation results. Our insulation teams use their product and installation knowledge to recommend the best option for the task and they keep your projects on schedule with prompt scheduling and efficient work. 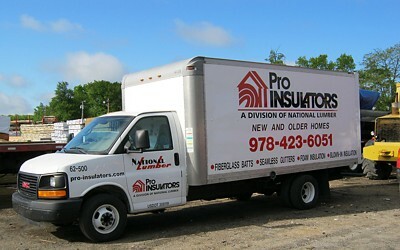 With the focus always on providing exceptional customer service with value-added product offerings and dependable deliveries, the addition of this trusted installed insulation service company is a welcome expansion. Since 1934 this family owned and operated company has been serving builders and homeowners throughout New England. National Lumber's growth has been accomplished through careful and measured planning, which is the foundation of our success as the largest independent building materials supplier in New England. We look forward to serving your building materials and services needs. Have you seen our trucks out and about? Our expert teams work on new construction, keeping your project on schedule as they work fast and efficiently. Then they leave your jobsite clean and ready for you to proceed. 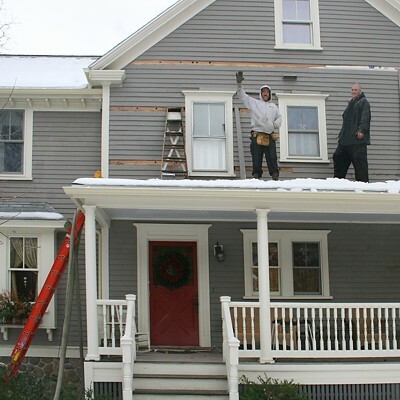 Renovating older homes should always include upgrading the insulation. Ideally while walls are open inside the house. But if necessary, it can also be done from outside by drilling holes and blowing insulation into the walls.